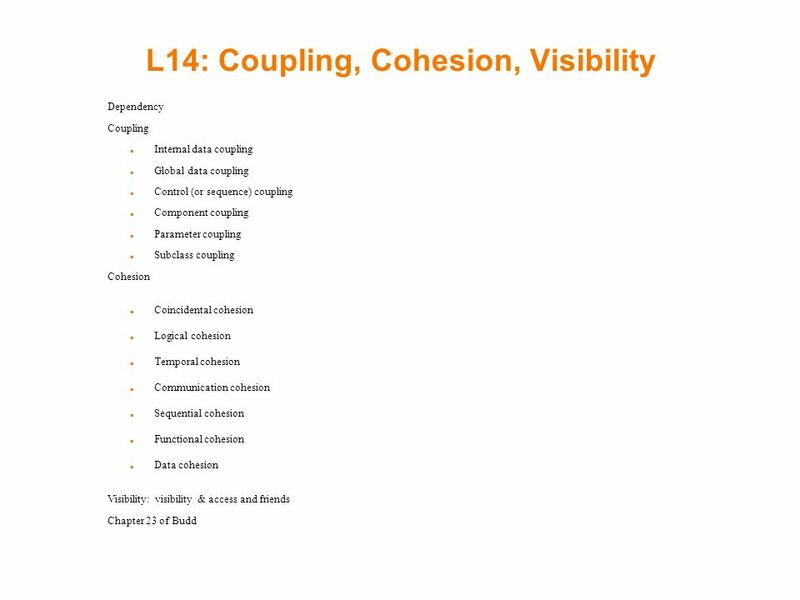 L14: Coupling, Cohesion, Visibility Dependency Coupling Internal data coupling Global data coupling Control (or sequence) coupling Component coupling Parameter. 2 Dependency If an object cannot meaningfully exist without another object, it is said to be dependent on the second object. 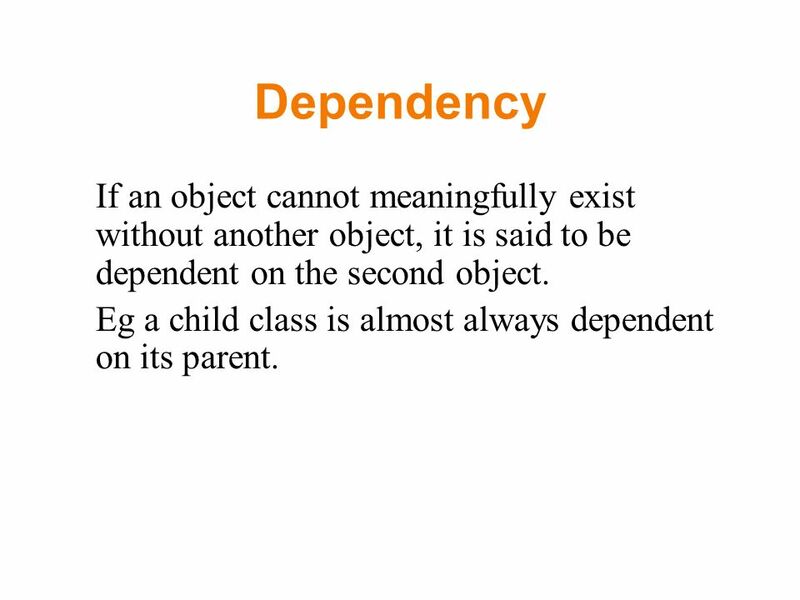 Eg a child class is almost always dependent on its parent. 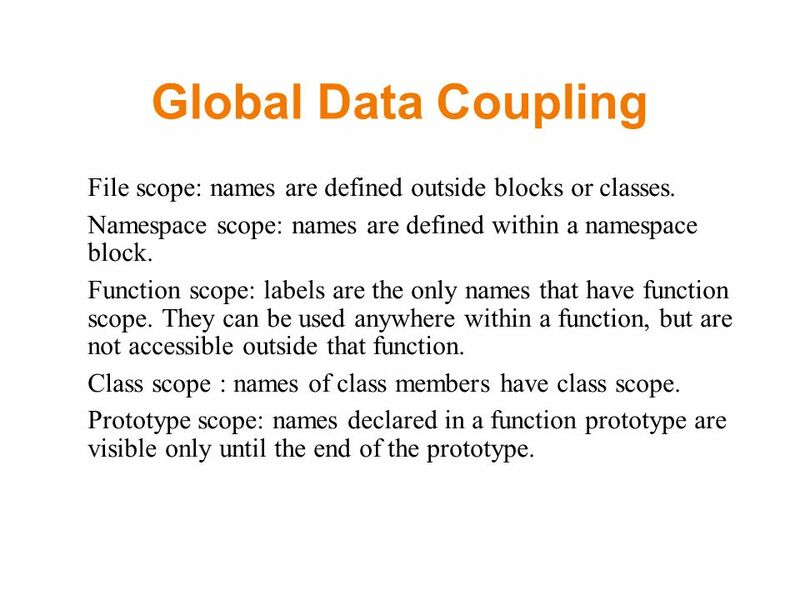 6 Global Data Coupling File scope: names are defined outside blocks or classes. 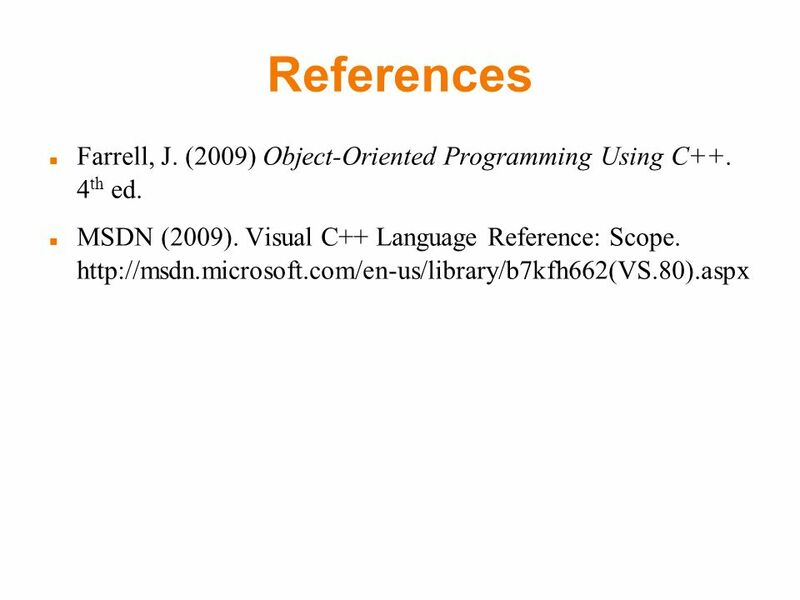 Namespace scope: names are defined within a namespace block. Function scope: labels are the only names that have function scope. They can be used anywhere within a function, but are not accessible outside that function. Class scope : names of class members have class scope. Prototype scope: names declared in a function prototype are visible only until the end of the prototype. 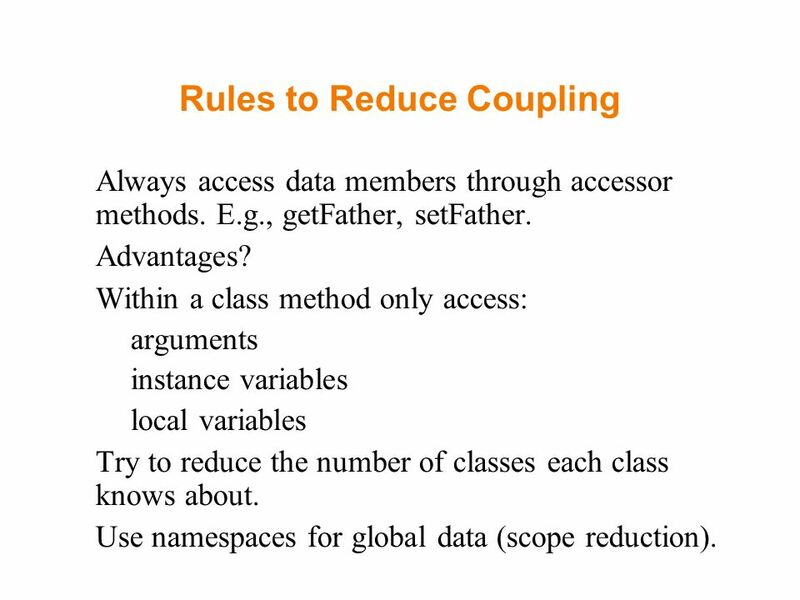 11 Rules to Reduce Coupling Always access data members through accessor methods. E.g., getFather, setFather. Advantages? 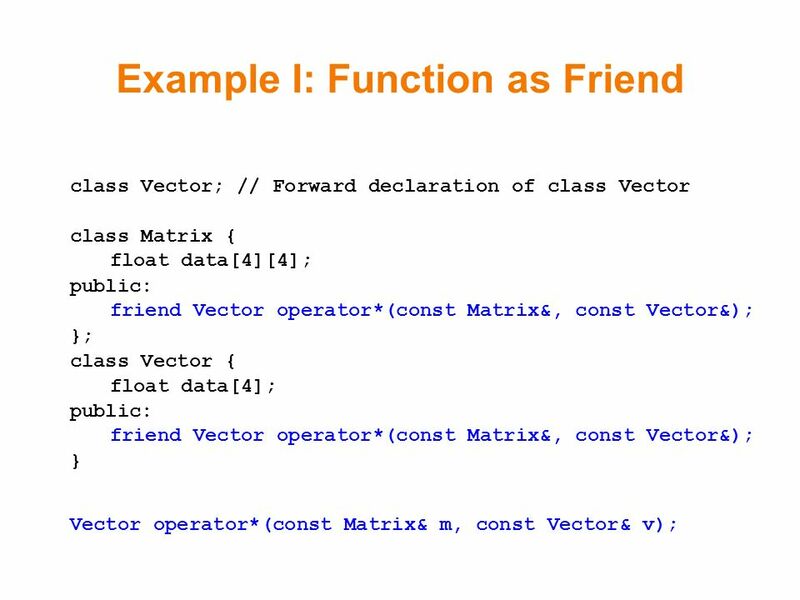 Within a class method only access: –arguments –instance variables –local variables Try to reduce the number of classes each class knows about. 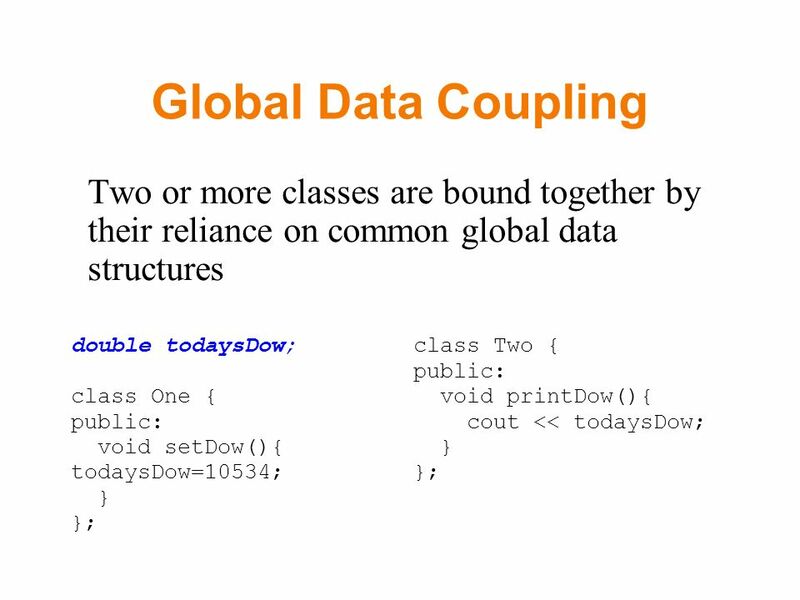 Use namespaces for global data (scope reduction). 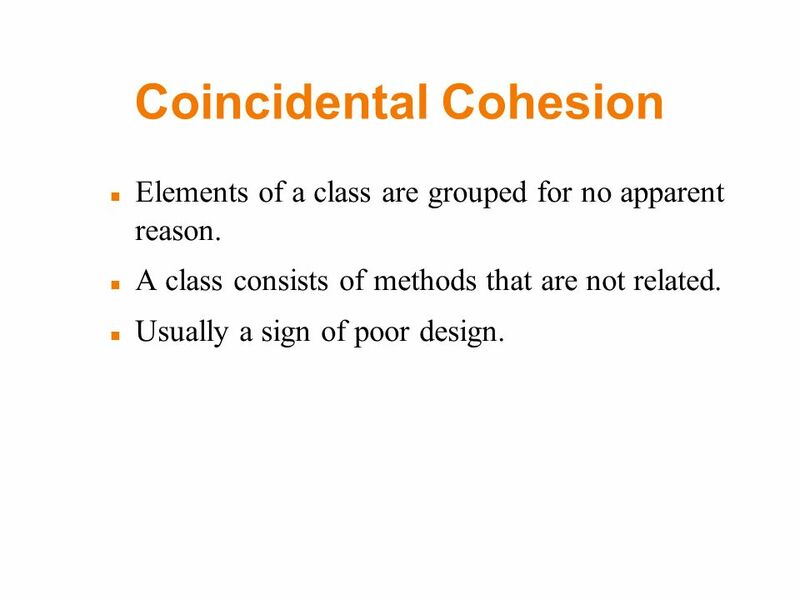 13 Coincidental Cohesion Elements of a class are grouped for no apparent reason. 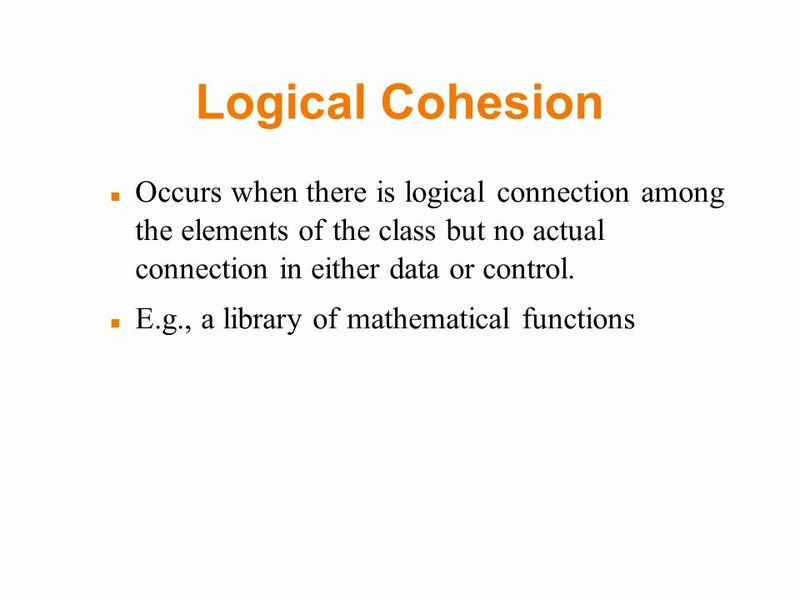 A class consists of methods that are not related. Usually a sign of poor design. 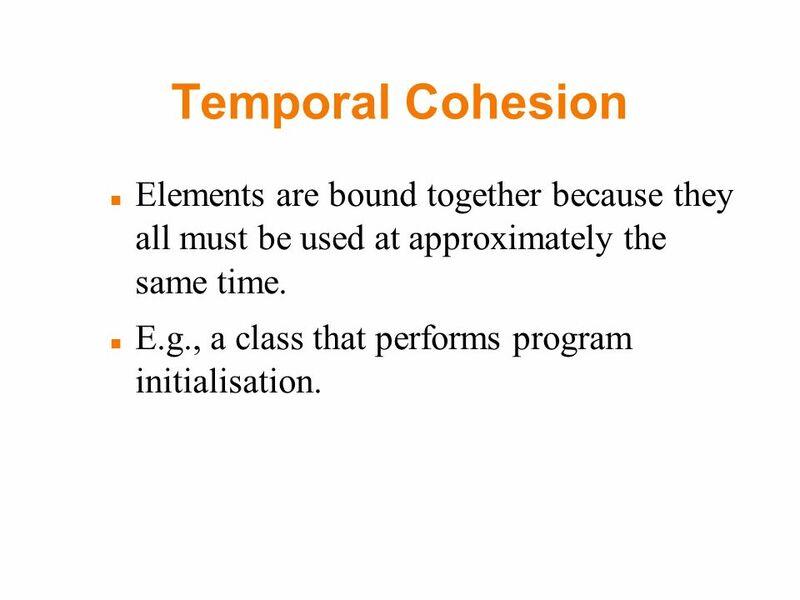 15 Temporal Cohesion Elements are bound together because they all must be used at approximately the same time. E.g., a class that performs program initialisation. 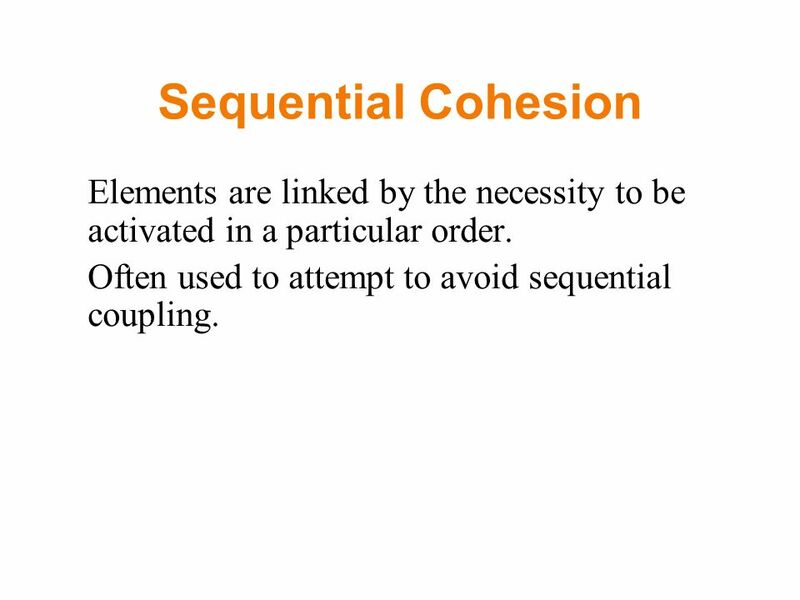 17 Sequential Cohesion Elements are linked by the necessity to be activated in a particular order. Often used to attempt to avoid sequential coupling. 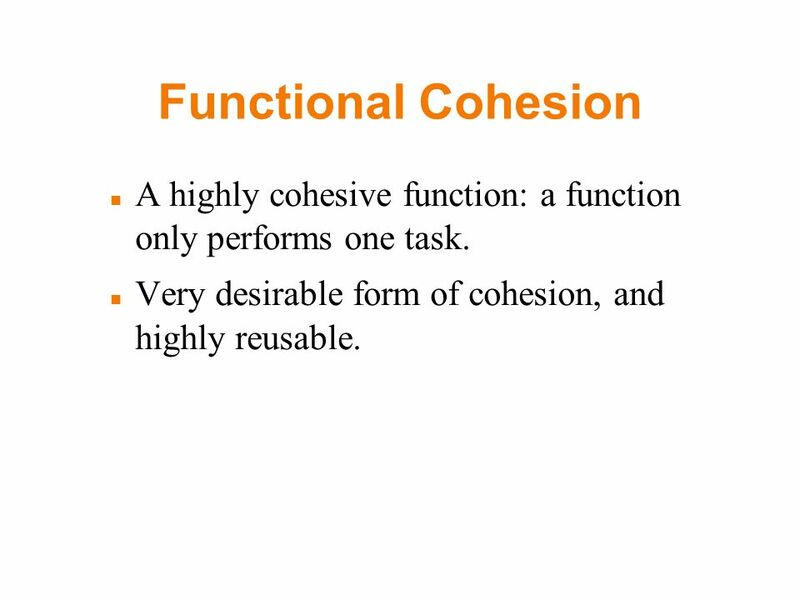 18 Functional Cohesion A highly cohesive function: a function only performs one task. Very desirable form of cohesion, and highly reusable. 20 Visibility An object is visible in a certain context if its name is legal and denotes the object. I.e., the object is in scope. 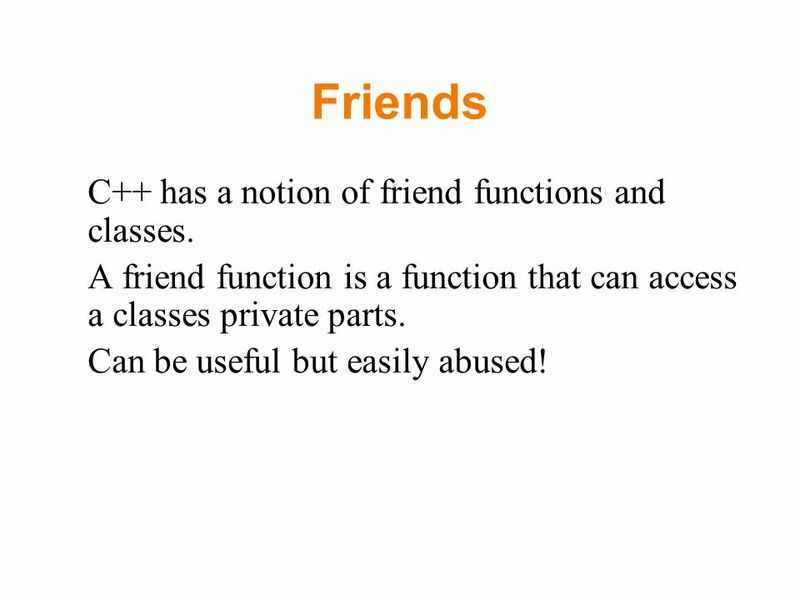 22 Friends C++ has a notion of friend functions and classes. 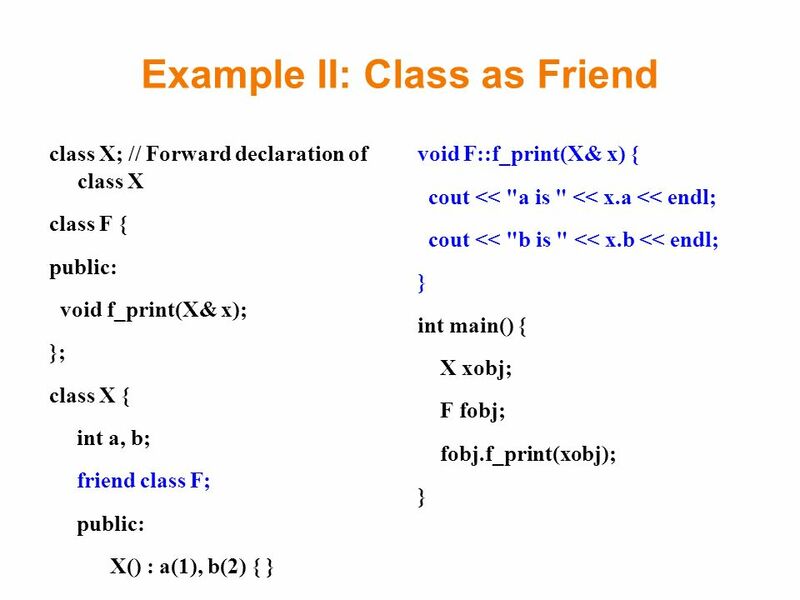 A friend function is a function that can access a classes private parts. Can be useful but easily abused! 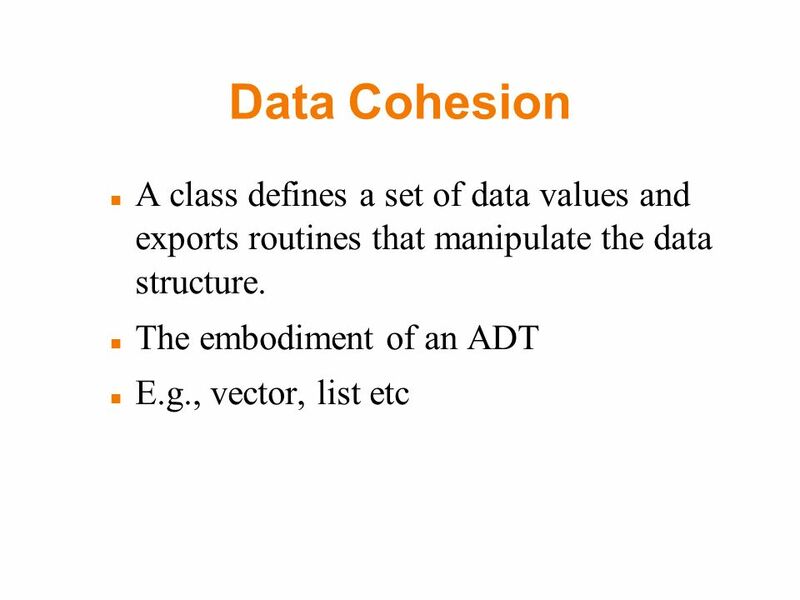 Download ppt "L14: Coupling, Cohesion, Visibility Dependency Coupling Internal data coupling Global data coupling Control (or sequence) coupling Component coupling Parameter." Chapter 5 Inheritance. Objectives Introduction, effects, and benefits of inheritance Base class and derived class objects Base class and derived class. 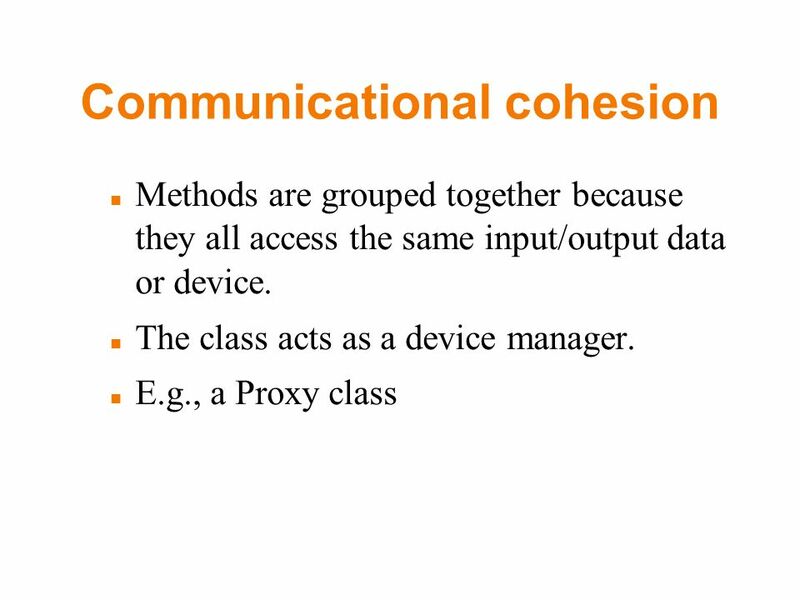 Quality of a Class Abstraction: Coupling & Cohesion Michael L. Collard, Ph.D. Department of Computer Science Kent State University. 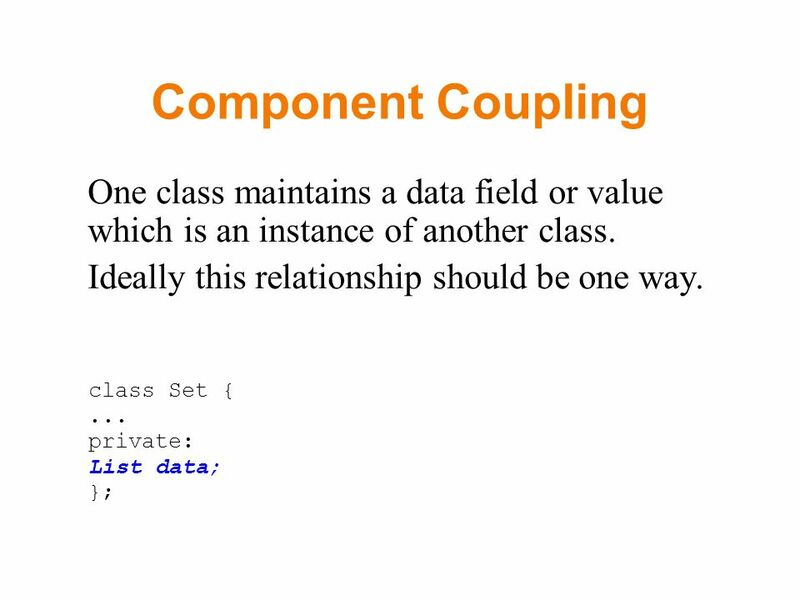 Starting Out with C++, 3 rd Edition 1 Chapter 10 – Characters, Strings, and the string Class. 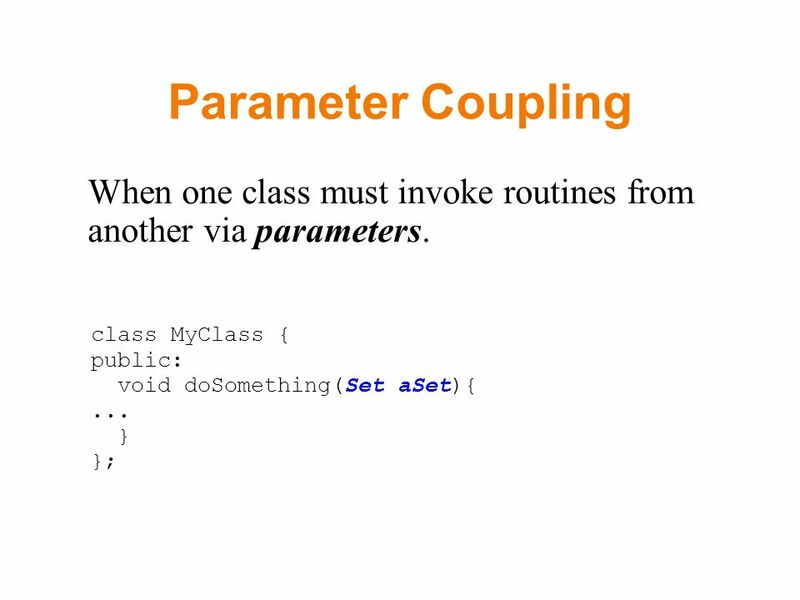 1 C++ string Class Chapter 6. 2 Agenda String Basics (cin, getline )  string operations mixed I/O using >> & getline() Table Output using setw() Functions. 1 Software Design Introduction  The chapter will address the following questions:  How do you factor a program into manageable program modules that can. Design Concepts And Principles Software Design -- An iterative process transforming requirements into a “blueprint” for constructing the software. Copyright Irwin/McGraw-Hill Software Design Prepared by Kevin C. Dittman for Systems Analysis & Design Methods 4ed by J. L. Whitten & L. D. Bentley. UMBC 1 Static and Dynamic Behavior CMSC 432 Shon Vick. Lecturer: Sebastian Coope Ashton Building, Room G.18 COMP 201 web-page: Lecture. UHD::CS3320::CHAP61 INTRODUCTION TO OBJECTS Chapter 6. 1 Lecture 3 Inheritance. 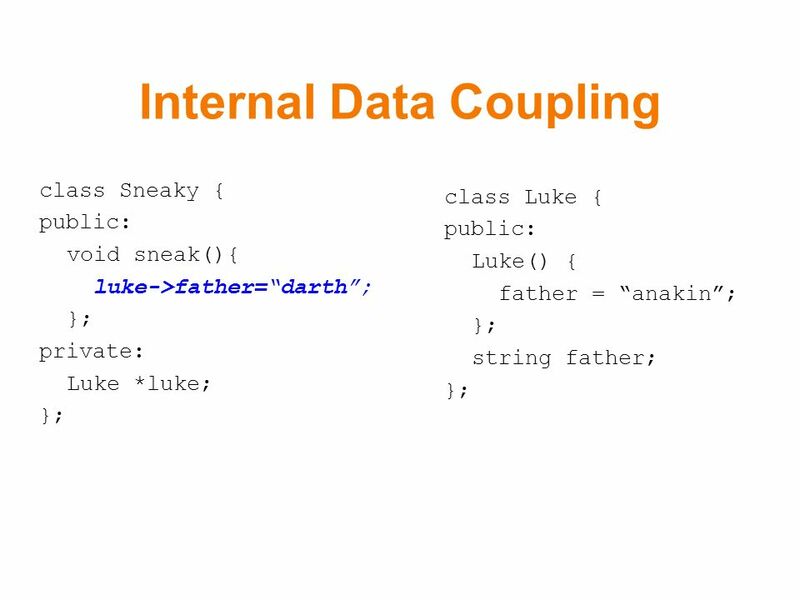 2 A class that is inherited is called superclass The class that inherits is called subclass A subclass is a specialized version. Module: Definition ● A logical collection of related program entities ● Not necessarily a physical concept, e.g., file, function, class, package ● Often. Jump to first page 1 System Design (Finalizing Design Specifications) Chapter 3d. Criteria for good design. 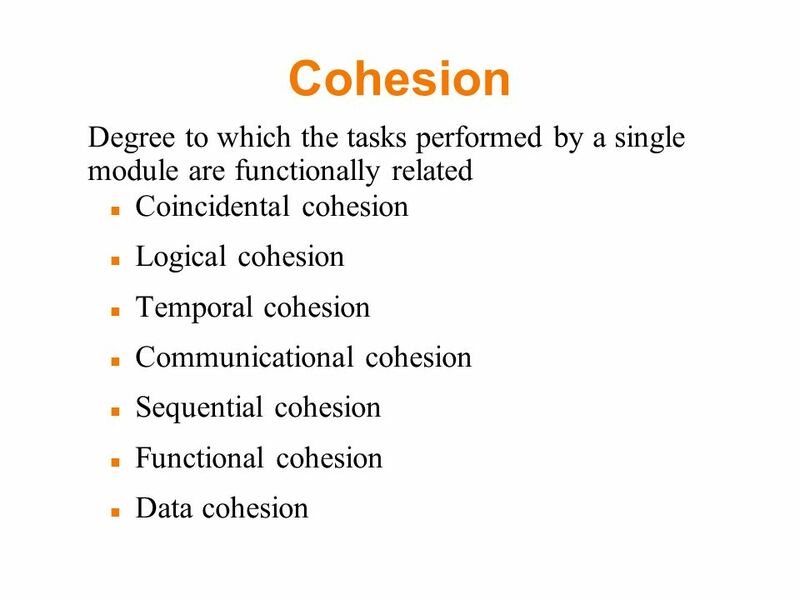 aim to appreciate the proper and improper uses of inheritance and appreciate the concepts of coupling and cohesion. Testing in OO Environment The reasons for testing is not any different for any of the design and implementation methodologies, including OO methodology.